When grain was ready to be ground, early settlers had the challenge of getting the grain to the mill with few roads. Footpaths through the woods were used and sleighs could be used in the winter. Stone-ground flour was much preferred to flour ground by hand. When roads became available, the grain was transported to the mill in horse drawn wagons. Farmers took their grain to the local mills for grinding into flour. At left is the Savocool Mill in South Perkasie, PA(now Richland Feed Co). 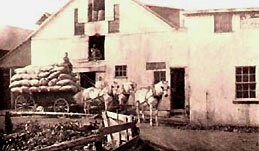 After processing at the mill, a horse drawn wagon was loaded with bags of grain or flour. The product was then transported to the local store or railway line. Beginning in 1889, the railway schedule improved in Perkasie. The railway lines could connect the farmer and his products to surrounding communities and regional cities such as Philadelphia and Allentown and Bethlehem. Eventually motorized trucks would replace the horse drawn vehicles, but many horses were still used in this area of Southeastern Pennsylvania until World War II (1942). South Perkasie Flour and Feed Mill on Walnut Street then owned by Jas. N. Savage South Perkasie Flour and Feed Mill in 1939. The examples above are from the town of Perkasie, PA. Similar local mills were found in communities throughout the United States.